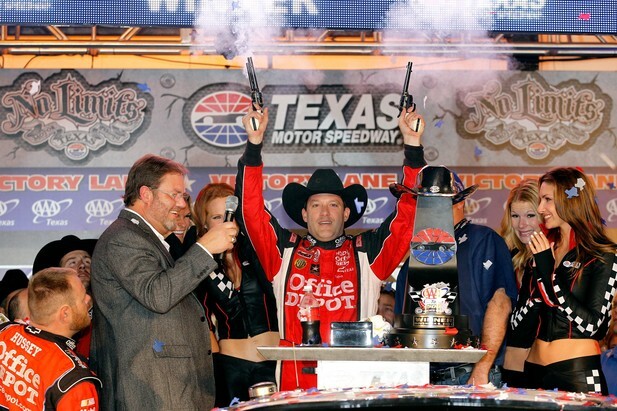 Tony Stewart was the one celebrating in Victory Lane at Texas on Sunday night. But, the main story of the week happened long before the green flag waved. Tony Stewart was the one celebrating in victory lane. He fired off the six-shooters as part of his dominating win at Texas. The margin between he and points leader, Carl Edwards, shrank from eight points down to three, as Edwards finished runner-up. That was the big news when the checkered flag fell, but it was not the story of the weekend at Texas. No, the story of the weekend first happened Friday night, then carried into Saturday morning, and ultimately was still talked about on Sunday. It didn’t matter what happened on the track, at least not in the Sprint Cup race. The big talk of the garage was all about what happened in the NASCAR hauler on Saturday morning, shortly after 9 a.m.
What happened all stemmed from an incident in the Camping World Truck Series race at the track. Kyle Busch and Ron Hornaday Jr. were battling in turn 1 on lap 15. Hornaday slid up, got loose, and both trucks went up the track into the outside wall. Minimal damage occurred to both vehicles, each appeared to be able to continue with some repairs. That is, until two turns later. By this time, the caution was posted, but Busch seemed to forget about that fact, or he didn’t care. He drove right up under Hornaday, tearing the sheet metal away, and then turning him straight into the outside wall. Busch was parked by NASCAR, and pulled his truck to the garage, and summoned to the truck. The morning after, he had another meeting with NASCAR officials, and NASCAR President Mike Helton. A half hour later, Helton came to the media center at the track, and announced NASCAR would maintain that position for the remainder of the weekend. To make things simple, Kyle Busch was not allowed to race at Texas. Many think it was the actions he had on the track that led NASCAR to this decision, and that is valid. However, I have a slightly different take on that. For my full opinion on it, click here. But, to keep things short and sweet with this column, I will give my take on it now that the entire weekend is done. The way I feel is that Busch’s on track actions, plus what he said after, were what got him parked for the race. “I’ve been wrecked four weeks in a row and finally I’ve just had enough of it. Sorry it was Ron Hornaday and he’s going after a championship, but the fact of the matter is you can’t place all the blame on one person — there was two people that got into it to begin with and there’s two people that ended it.” That is exactly what Busch said on Friday night after the wreck. There was little sorrow for his actions, and even less remorse. Hornaday was in the thick of a great title hunt in the Truck Series, and possibly could have won it. After the wreck, his deficit became one that could not be made up in just one race, which is all that’s left to run for the trucks in 2011. My opinion is this, had he not reacted the way he did after the wreck, both on the track and in the garage, he probably would have been given a points penalty at the end of the weekend, pay a hefty fine, and call it done. But, Helton made it clear that in the new day and age of the “boys have at it” mentality, a line had to be drawn as to what was the limit. There is one individual that can be blamed for Busch’s actions, and that’s Busch himself. Further penalties could come of it, not just from NASCAR, but also in-house from Gibbs and associates. Mars Candy Company, who is the lead sponsor for Busch’s Sprint Cup car, expressed it’s displeasure with Busch and his actions. The statement also hints a bit that they could pull out as a sponsor, but didn’t say outright. Joe Gibbs himself dodged the question as to whether Busch had a future at Joe Gibbs Racing, neither saying he had a ride nor that he didn’t have one. I can guaranteed that personally, you won’t see me snacking on a pack of M&Ms, taking a bite out of a Snickers bar, nor chewing on a piece of Doublemint gum to freshen my breath. I’m not a Kyle Busch fan, especially since he joined Gibbs in 2008 and began seeing all the antics he’s shown as a driver. For all the fans of Busch that read this, I’m sorry, but that is my blunt and honest opinion. I’m not a fan of his, and after his actions this weekend, I never will be. CAUTIONS: 5 for 21 laps. Lap 113-116 (Debris), 202-206 (#36, 42 accident-BS), 241-244 (#48 spin-T4), 263-266 (Fluid on Track), 271-274 (Debris). LEAD CHANGES: 23 among 10 drivers. Biffle 1-23, Kenseth 24-42, Stewart 43-45, Kenseth 46-88, Edwards 89-90, Kenseth 91-112, Edwards 113, Menard 114, Kenseth 115-116, Stewart 117, Kenseth 118, Stewart 119-158, Johnson 159, Keselowski 160-161, Stewart 162-202, Kahne 203-206, Stewart 207-263, Edwards 264-274, Stewart 275-300, Kahne 301, Burton 302-319, Newman 320-323, Burton 324-329, Stewart 330-334. TIME OF RACE: 3 Hrs, 16 Mins, 51 Secs. 2011 Chase For The Sprint Cup: 1. Edwards, 2316 points; 2. Stewart, -3; 3. Harvick, -33; 4. Kenseth, -38; 5. Keselowski, -49; 6. Johnson, -55; 7. Earnhardt Jr, -79; 8. Gordon, -81; 9. Kurt Busch, -87; 10. Hamlin, -99; 11. Kyle Busch, -100; 12. Newman, -103.